The roof is the one part of a house that really protects occupants against the elements. Wind, rain, snow, sun and any inclement weather are constantly beating down on the roof of your house and this combination can have dire effects. Using a quality roofing firm and superior roofing materials means that you will be protected from all but the harshest of these conditions. However, when the weather really strikes, there is very little we can do to ensure the integrity of our roof. Storm damage repair can be costly, however, it is much cheaper than leaving it to get worse and worse. Regardless of the quality of your roofing and how well you look after it, certain circumstances invariably lead to damage that must be replaced as quickly as possible to avoid further, much more costly damage to the roof and to the structure of the home itself. Paying for good storm damage repair is absolutely essential in maintaining the integrity of your home, and having the storm damage repair done quickly is also vital. Small cracks or holes can quickly lead to bigger problems so you should get a quote from a trusted and respected company as soon as you possibly can. Very few people really know anything about storm damage repair and unless you have been in the unfortunate circumstance of needing it done it is unlikely you will know where to start. Attempting storm damage repair yourself can prove more costly than paying a professional to complete the job properly. Obviously, though, you will want to stop the rain and the wind from getting inside the house and if the storm has hit several houses in your area it may be a short while before you can get a roofer to come and fix your problems. Temporarily you might want to consider securely fixing some tarpaulin over any holes. It is important that you do this very securely and that you don’t leave any gaps, no matter how small the gaps may be. If you do leave even a small hole then the wind can easily get underneath the tarpaulin and rip it up taking yet more of the roof with it. You should fix the tarpaulin to the outside of your roof because while fixing it inside may prevent it from catching in the wind, rain will collect and run into the house, making your temporary storm damage repair useless. The tighter you can pull the tarpaulin over the hole the better, so tightly secure one end and then gradually move around pulling it tight and securing it in place with plenty of roofing nails. If you get it tight enough with no holes there is no reason that you will take on further leaks while you wait for a professional roofing contractor to come out and complete the required storm damage repair. 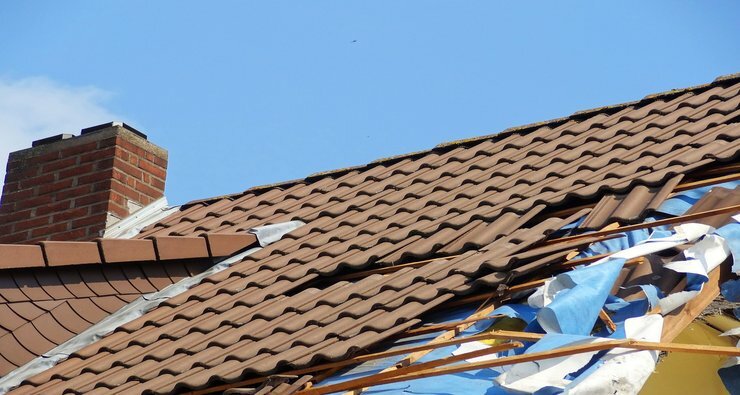 Bear in mind that full storm damage repair will first involve a thorough checkup of the whole roof and simply fixing the holes that have appeared might not be the full picture of what is required.